Young people from the Mencap group collectively researched Amy Johnson to come up with their design. They spent time looking at notable points of Amy’s journey to decide on the appearance of their moth. The moth displays the main elements of Amy’s journey. Her portrait is incorporated on the front of the moth, adorned in her iconic flying cap. Amy’s flight path from England to Australia is displayed on one wing, while the other is dressed with the flags of all the countries in which she landed. The design uses different materials to represent the soldiers’ shirts used to repair a torn wing part way through her journey. 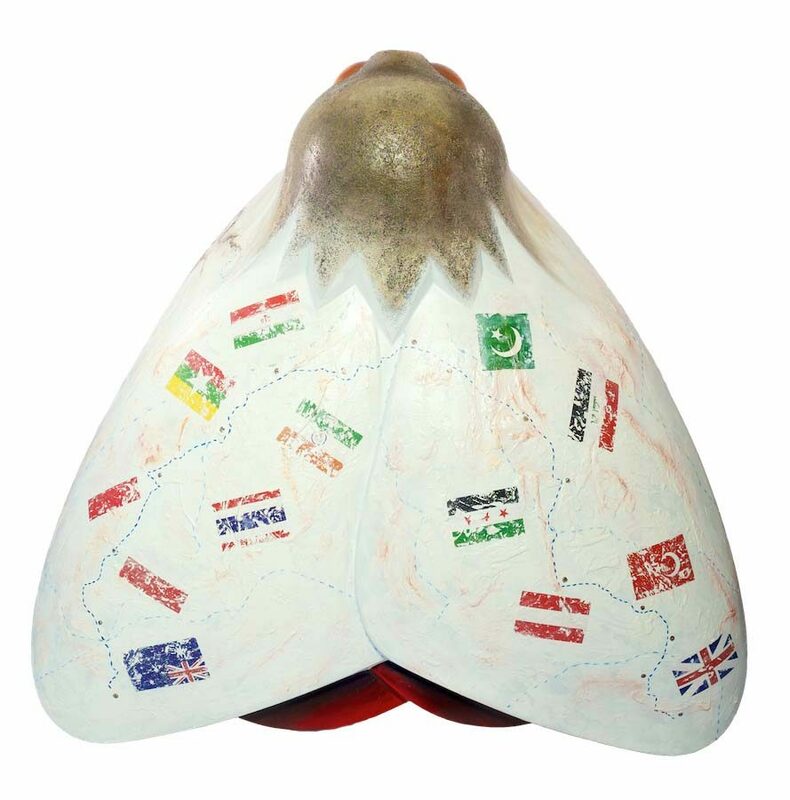 Underneath the moth, bright, fiery colours represent the heat of Australia, as well as Amy’s passion and determination that spurred her on to complete her mission. The design group is made up of individuals with learning difficulties, aged 18-24, who are part of Mencap’s Talent Match project. The project sees them work through barriers in life to gain social and independent living skills. As part of the project, young people are encouraged to take the lead and have their voices heard. The group worked with Jenni Cluskey, a visual artist based in Hull. Talent Match Humber is a Big Lottery funded project for young people designed by young people, with the aim of helping those aged 18-24 who are long term unemployed and struggling the most to find career opportunities. Humber Learning Consortium is the project lead for Talent Match Humber and acts as a management and quality hub for learning and skills providers across the Humber and Yorkshire.